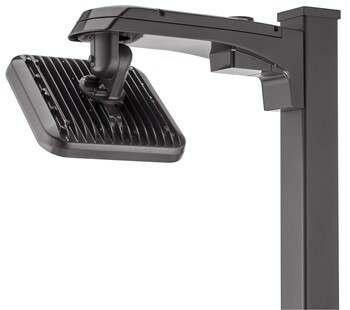 Resource Lighting + Controls offers DLC rated fixtures in every category. Our top selling area light fixtures with DLC are listed below (in no specific order). Each have unique features. Depending on your project needs (i.e. budget, code requirements, end user expectations, design aesthetic, facility to be lit), the perfect lighting fixture will require unique specifications. For help determining the best fixture to fit your needs, feel free to contact us for more information. Some rebate programs require DLC listed or Energy Star Rated fixtures in order to qualify. Area lighting codes in the Hampton Roads areas do not require DLC listed products; many of our lighting products feature high efficacy and great warranties but don’t have the DLC designation. The fixtures below range from economy pricing to moderately priced depending on the specified features; DLC listing versus non-DLC is not an indication of pricing. Acuity Brands has thousands of DLC qualified and energy star certified products available and you can search by category here: Acuity Brands Energy Efficient Products. Field adjustable rotating head; This video demonstrates how the fixture head can be adjusted to maximize versatility. 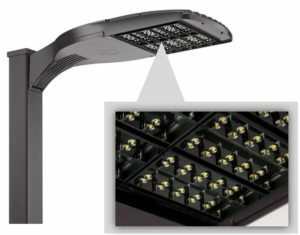 Perfect for smaller parking lots with 3 distribution types allowing you to dial in on the perfect lighting distribution with budget friendly pricing. For larger parking lots and car dealerships, the D-Series with BLC by Lithonia helps you meet the strictest LEED requirements for lighting trespass. Optional BLC Optic offers the ultimate BUG (backlight, uplight, glare) rating performance. 14 beam distribution types available for extreme accuracy in photometric planning. 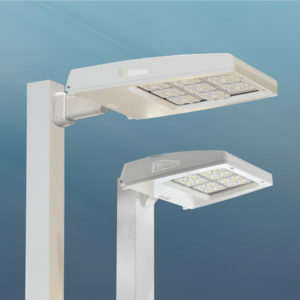 NLS Lighting uses silicon optics in their DLC rated NV-series area light. Micro optical system offers superior clarity that withstands heat and UV aging resulting in clear optics that don’t crack or become yellow over time. An independent test report by Dow Corning showed that an acrylic lens completely yellowed after 6000 130-degrees C, a poly-carbonate significantly yellowed, while the NV-series silicon optic remained as clear as the initial zero hour of operation. 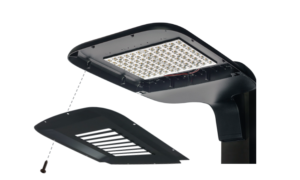 Features a wide range of light distributions: 2, 3, 4, 5, and N2 (24 degree narrow beam). Knuckle Mount Option for up-tilt of up to 114 degrees. Made in America: designed, tooled, fabricated and assemble in the USA. Asymmetric Flat Beam Area Light is gaining favor on campuses, office parks and multi-family residential due to its modern, clean aesthetic. BEGA can supply replacement LED modules up to 20 years after the purchase of LED luminaires, making this high quality, US made are light long lasting! Leotek Arieta has been upgraded to meet DLC. 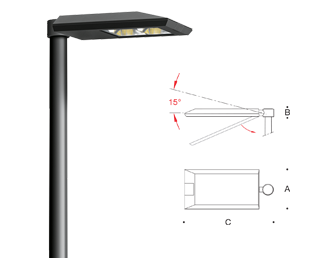 Field installable Back Light Shield option (BLS) helps meet strict light trespass and LEED requirements. Field installation helps end user address trespass issues quickly and at low cost. A variety of options including part-night dimming, rotated optics, ANSI 7-wire photocontrol receptacles, motion sensors and more.